Walworth Joint School District #1 earned 3 out of 5 stars on the DPI School Report Card for the 2017-2018 school year. 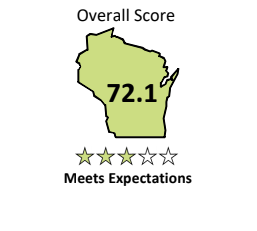 Based on the star rating, Walworth Joint School’s overall accountability rating is categorized as Meets Expectations. School Report Cards are issued based on four priority areas: student achievement in English Language Arts and Mathematics, student growth, closing gaps between student populations, and measures of readiness for graduation and postsecondary success. Keep in mind that while school and district report cards provide information to the community, they do not represent all of the work and successes happening at a school. Report cards are intended to help schools and districts use performance data to target improvement efforts to ensure students are ready for their next educational step, including the next grade level, graduation, college, and careers. We are very proud of the achievements and gains in academic growth that students are showing at Walworth. We also recognize the need to continue our efforts in closing achievement gaps in Math and English Language Arts. We will continue to emphasize the development of the whole child while providing best practice in instructional delivery, student engagement, tiered learning and assessment practices so that we may continue to live up to our promise of providing the BEST EDUCATION FOR ALL STUDENTS! Click here to access the full report card and Educational Options Notification.